The use of most functions is self-explanatory. Some functions are explained below. By default, the program does not write anything to the disk until the option Options –> Save Options is checked. If the option Options –> Use exe’s directory is checked, the program tries to save the ini-file and, if applicable, the folder containing thumbnail galleries in the directory where the program itself is saved. This option can be useful by running on external media like USB drives, etc. Otherwise, the program tries to save the files in the home directory of the current user. If you clear the checkbox Options –> Save Options, the program removes all program-related directories and files. It is recommended to do it before the exe-file is removed since a special uninstall procedure/tool is not provided. All options can be divided into two groups: the ones that cause an action immediately after activation and the ones that do not. For example, if you switch between framed and frameless or between windowed and fullframe modi, the look of the program changes immediately. Otherwise, changing the Options –> Initial Show Mode option leads to a different behaviour only for the next image. The user interface is old school. Instead of miraculous and colorful animated buttons, you will find instructive menu items here. The program is still under development, it certainly contains some bugs and lacks some features. BelleVue provides three methods to show an image saved in a raw file: (1) by using an embedded preview, (2) by using a built-in raw converter, or (3) by using a WIC-enabled codec. Many (in fact, almost all) raw formats contain embedded JPEG or RGB preview images. If the option Options –> Show Embedded Preview of RAW is checked, the program searches through the raw file for the largest embedded preview image and, if successful, shows it. The current version works reasonably well with formats such as CR2, CR3, CRW, TIF (Canon), ARW, MRW, NEF, NRW, PEF, DNG, RAF, RW2, RWL, ORF, KDC (compacts), SRW, SRF, SR2 and X3F. The displayed image size corresponds to the size of the preview image. This size can be the same or different from the size of the original raw image. If you want to see the image based on the raw data rather than the one based on the preview data, you needn’t switch to another mode. Instead, you can use the command View –> Show RAW instead of Preview that replaces the image for the current file. Where it can be useful: The use of an embedded preview is faster than generating an image from raw data. Until the camera manufacturer changes the file format, which does not happen often, this feature also works with newest cameras whereas dedicated raw converters should be updated first. BelleVue provides a simple built-in converter that runs out of the box and does not need any additional components. Where it can be useful: Whenever the size and/or the quality of the embedded preview image is not good enough. It can be too small (usual for older formats), or it can show compression artifacts (banding in a blue sky). In such a case, it is more useful to see an image based on raw data and not just a preview. 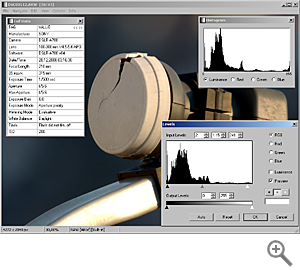 The built-in converter displays original raw images fast and with the quality reasonable for an image viewer. Since the built-in converter is written from scratch, without using any other source code, it shows images a bit differently than other converters do. This can be useful in the case when it is necessary to find out different ways how a specific raw file can be interpreted. BelleVue also supports the DNG format in general, though, with some limitations. Lossy compression and non-standard CFA patterns (= Fujifilm) are not supported. The program can use codecs compatible with the Windows Imaging Component (WIC) that is installed on Windows XP SP2/3 and later. There are many sources for these codecs. Microsoft provides the free Microsoft Camera Codec Pack. In Windows 10, this module is installed by default. Otherwise the user should install it manually. Some camera manufacturers also provide WIC-enabled codecs that can be downloaded for free. If any WIC-based codec is installed on the computer, you can select your default converter by changing option Options –> Select RAW Converter. Then, the program will try to show an image by using the default converter first. You can determine what happens if the default converter fails: either the program will try another converter or it will show a black square. The converter that was actually used is displayed in the status bar. You can get a list of WIC-enabled codecs installed on your computer by the command Info –> Codecs. My impression of the tested WIC-enabled codecs provided by camera manufacturers is a mixed one. In general, they provide a proper image quality (with some exceptions, see more below). On the other hand, they are very or extremely slow and mostly not up-to-date. You should carefully read the list of supported cameras before installing a codec. From a programmer’s perspective, it’s funny to see how diverse is the implementation of the WIC-interface by these codecs. Some codecs produce images based on JPEG data and not on raw data. That are the Sony codec and the Microsoft DNG codec provided with Windows 10. Metadata are displayed in a separate window. Its name Exif Data does not exactly describe the content. Though, for the most part, information is retrieved out of records saved in the Exif format, other sources like maker notes, which usually contain very different data, also are used. 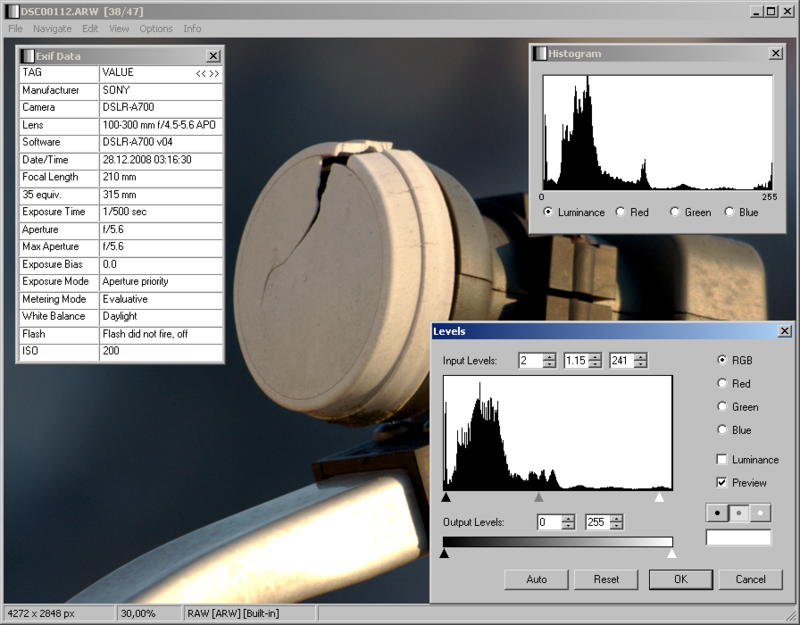 Additionaly, the program supports the CIFF format which was used by older Canon cameras. GIF animations are played in a separate window. The player supports two commands: Continue [P]laying and [P]ause. Animated GIF files contain multiple frames that are, from a technological point of view, valid images and can be diverse size. The main window as well as the gallery show only the first frame. Therefore, if the first frame is a small image (even 1 x 1 px is possible), they will virtually show nothing. However, the displayed image size corresponds to the size of the canvas or the output area of the whole animation. The animation window will be this size. Rotating the image displayed at the main window does mean only rotating the first frame, whereas the canvas is not affected. For this reason, the displayed image size keeps constant. You can save the displayed image, but this is the first frame only and not the whole animated GIF file that will be saved then.